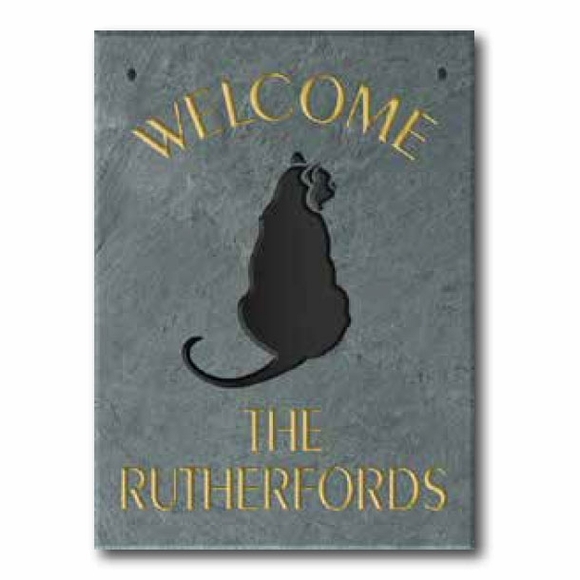 Personalized Slate Welcome Sign with Cat - - 9" x 12" stone Welcome sign personalized with your name, address, or alternate text. Made in USA. The word "WELCOME" and image of a seated black cat come standard on this plaque. Line 1 holds up to five (5) characters (including spaces). Line 2 holds up to twelve (12) characters (including spaces). Note: The personalization on lines 1 and 2 can be a family name as shown, an address, or other text as long as it fits on the line. Crafted from slate that is newly quarried in the USA, hand cut to size, sand carved, and painted with durable enamels. Please allow 3 to 5 weeks for delivery.